Don’t forget to go to Confession! Fr Pawel is in Poland until Boxing Day. Upcoming Advent Preachers: Our last Advent preacher will be Dr Andrew Pinset, a priest of A&B Diocese and the Research Director of the Ian Ramsey Centre for Science and Religion at Oxford University and finally we will have Fr Andrew for Christmas. 6pm Carols followed by 6.30 Children’s Mass. 8pm (Convent) Misa En Espanol. 9pm (Latin); 11.30pm Carols followed by Midnight Mass. 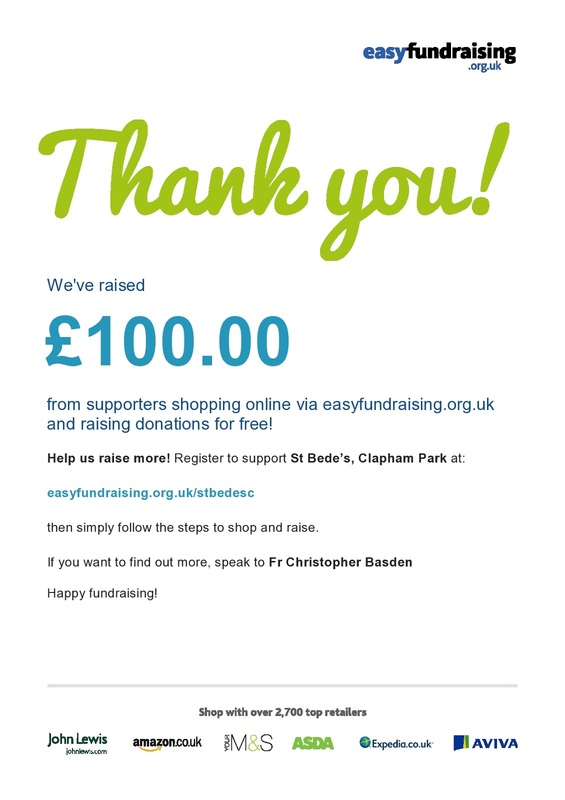 Thank you for the Bazaar: The money received so far from all the various events have now been counted and we managed to make a profit of £10,423. A summary of how each stall did is pinned to the notice boards and copies are available for you to take home. We still await a couple of donations and will produce our final total in the new Year. 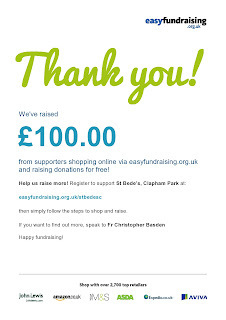 Visit our dedicated page HERE for more details on how you can sign up to support us at St Bede's. This is an ongoing project - not just for Christmas or Bazaar time. We hope to be able to raise money in this way for many years to come. 'Special Sunday' – Today 11am Mass: Sung by Cantores Missae under the direction of Mr Charles Finch. Recession: Alma Redemptoris Mater (Giovanni Perluigi da Palestrina). Welcome to Jo-Anne Rowney: who is coming to meet young adults with a view of talking about meeting the Pope for World Youth Day in Krakow, Poland at the end of July / beginning of August. Margaret Howard: was visited by Fr Pawel and Fr CB and the new house was blessed. She sends love to all at Convent and at St Bede’s. Laundry of Servers Cassocks: We need some volunteers to take our cassocks home to launder and iron. Please speak to Fr CB today. We need new cleaners too: Some of our cleaners who have been on the rota for many years no longer attend this Church or are unable to help us any longer. It is usually one Fri eve or Sat morning once every 3 months. Please hand in your details to 1 of the priests.